What are Avid Friendchips Microchips? Avid Microchips are an easy way to save the live of your pet or livestock. Every few seconds, a family pet gets lost. In fact, 1 in 3 pets will go missing sometime in their lives. Most of these pets end up in municipal shelters, animal control facilities and humane societies across the United States. Tragically, most of these pets never make it back home because their owners didn't microchip them and they can't be found through other means. Developed by a veterinarian, the Avid Microchip is are an effective and safe way to identify your pet. The FriendChip is a tiny microchip that fits through a hypodermic needle and is injected under the skin of your pet where it remains safely for life. This inexpensive procedure can be done anytime and, best of all, protects virtually any pet you love: dogs, cats, horses, birds, reptiles, exotics, even fish! Who are Avid Friendchips Microchips for? How are Avid Microchips used? Each chip contains a 9 digit Alphanumeric code. These chips are in the 125kHz range and work with Avid Breeder Reader, Avid Minitracker 3 or most universal readers. How many Avid Microchips do I get? 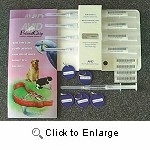 The Friendchips Pack includes: 5 Avid Microchips sterile syringes, numbered stickers, informative brochures with PetTrac registration forms, and "I Am Lost" Collar Tags.